Dubbed as ”One Nation One Card”, the inter-operable transport card would allow the holders to pay for their bus travel, toll taxes, parking charges, retail shopping and even withdraw money. The Prime Minister launched the NCMC while inaugurating the first phase of the Ahmedabad metro train service. 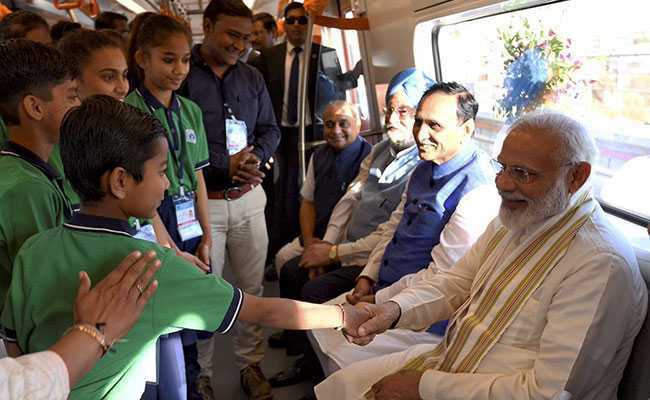 After inaugurating the 6.5-km stretch of phase one of the Ahmedabad Metro, connecting Vastral to Apparel Park Area, PM Modi also took a ride on the metro. “This card runs on RuPay card and it will eliminate all your travel related problems. Many a times, we do not have change to pay in cash while travelling in metro, bus or train, or for toll and parking. To overcome this issue, an automatic fare collection system was introduced,” PM Modi said. “Now, our dream of ‘One Nation One Card’ has been realised. People can also withdraw money using this Common Mobility Card. This RuPay card can be used for travelling in metros in any part of the country. In simple terms, we have merged the RuPay card with the mobility card,” the prime minister said. “Now, we have this ‘Made in India’ card. Only a select few countries have this technology of ‘One Nation One Card’,” PM Modi said. “The stored value on card supports offline transaction across all travel needs with minimal financial risk to involved stake-holders. The service area feature of this card supports operator specific applications e.g. monthly passes, season tickets etc,” it said. “Till now, AFC systems deployed at various Metros are from foreign players. In order to avoid the vendor lock-in and create an inter-operable system, there was a need to develop indigenous standards and AFC system under Make in India initiative,” the release stated.